Published by the American Geophysical Union as part of the Coastal and Estuarine Studies, Volume 60. Interactions between macroorganisms (benthic fauna and macrophytes) and the biogeo-chemistry and microbiology of aquatic sediments have proved essential for the functioning of most benthic marine ecosystems. While our knowledge of the biogeochemical consequences of macrobiological activity has grown considerably during the last two decades, the feedback mechanisms and physicochemical forces controlling the abundance and diversity of benthic animals and plants still elude definitive analysis. In order to clarify the state of the science and provide a framework for future research, we present in this volume a synthesis of latest developments in research on interactions between animals, plants, and microorganisms in marine sedimentary environments (including intertidal areas, continental shelves, deep-sea sediments, and cold seeps). Of particular importance are the new experimental (field studies, laboratory experiments) and theoretical (modeling) approaches, which we also discuss. 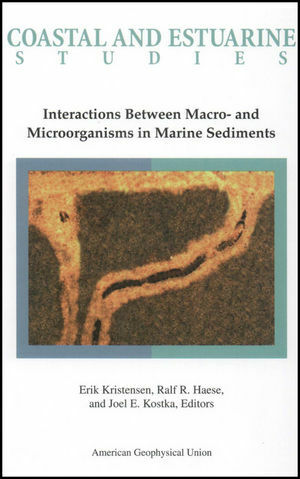 Erik Kristensen and Ralf R. Haese are the authors of Interactions Between Macro- and Microorganisms in Marine Sediments, published by Wiley.